XS (S, M, L, 1X, 2X, 3X) or Bust Sizes 28-30 (32-34, 36-38, 40-42, 44-46, 48-50, 52-54)"
14 sts = 3” 7.5 cm and 22 rows = 4” 10 cm in St st on larger needle. Glam up your wardrobe with this little number! Sequins are easily knit in throughout the fabric with the Disco Lights yarn from Tilli Tomas. 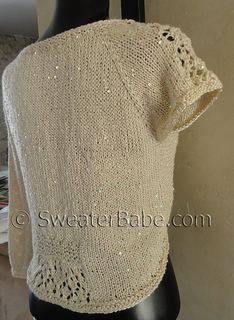 The end result is a shimmery, beautiful cardigan that catches the light and everyone’s compliments! 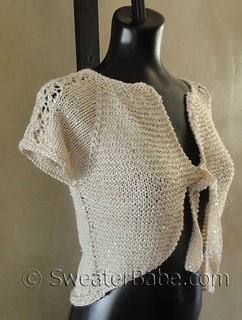 The back is in Stockinette stitch, with a nipped in waist and lace detail. The bottom of the cardigan is higher in front and curves lower in back for a wonderfully flattering and unique touch. Sleeves can be left short (see photo on next page) or knit to an elegant bracelet length, with a very open lace panel running down the center. Knit this beauty using the fancy Tilli Tomas yarn – which comes in other glamorous colors like Jade or American Beauty (a rich red with so much depth of color! ).